Out of stock since Tuesday, 20 March 2018. Due back soon. The Stubbs Sexdecuple Tower is a favourite for shops and show stands as it is so incredibly simple and effective. 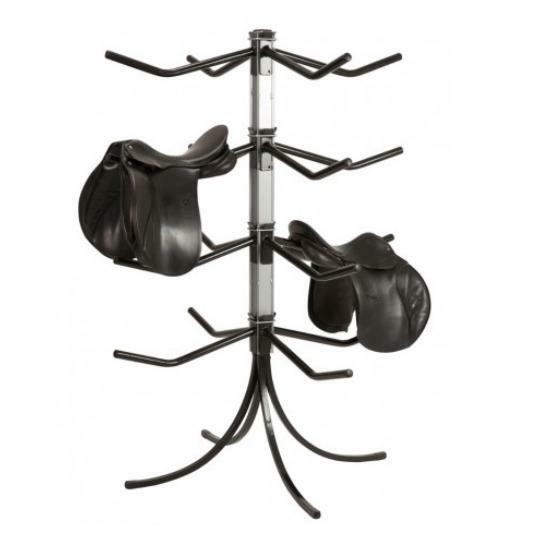 Displays 16 saddles individually in 1.35m square. Rapid assembly in less than 5 minutes, legs insert into base of pillar, arms hook on — no tools or fixings required. Unique leg design can accommodate partially uneven floors without adjustment. Packed size is car and pallet friendly. Pillar bright Silver, arms Black Stubbyfine coating. There are currently no questions for Stubbs Sexdecuple Tower - be the first to ask one!